Yesterday, two teenagers were bit by a shark in North Carolina and got severely hurt. This serves as a reminder that, no matter how much we may love these sharks, they are not harmless pets. We have to stop portraying them as either mindless killers or harmless pets that just want to be hugged. Before I say anything else, I want to send my best wishes to the victims of these attacks. Regardless of how rare shark attacks are, it doesn't help them that the chances of getting bit are slim. They got hurt and have to live with the consequences for the rest of their lives. If we want to protect these awesome and important predators, we have to start portraying them the way they are. We have to educate people and give them a real understanding of sharks. If we keep telling them that these sharks are harmless and just want to be hugged, we loose credibility, every time someone gets bit. We have to acknowledge that sharks are not harmless. We have to say that there is no need for fear, but that we have to respect them. Every time we post pictures of bikini clad "shark whisperers" holding on to a great white shark and try telling people how harmless they are, we just reinforce their belief that we are out of touch with reality. When we do that, people will not listen to us, when we tell them how important the shark are to a healthy ocean environment. We have to acknowledge that sharks do occasionally attack, but let's put things into perspective. Time after time, people point out things that are more dangerous and kill more people than sharks each year. I'm actually hard pressed to find something that kills fewer people than sharks do. So why is it that people are generally afraid of sharks? When we go into the water, we are in an environment that is foreign to us and people tend to be afraid of what they don't know. Our fear of sharks is similar to our fear of flying. Even though airplanes are the safest form of transportation, there are more people afraid of flying than taking any other mode of transportation. Part of the reason is that just like when a plane crashes, every time there is a shark attack, the news goes around the world and creates a perception that sharks are more dangerous than they really are. Every time we go into the Ocean, we have a chance to see a shark and an even greater chance to be seen by one, yet shark attacks remain extremely rare. Shark Diver has been diving with sharks for 15 years. We never forget that we are dealing with predators and conduct all our dives with safety in mind. When diving with white sharks, we use cages. When we dive with tiger and bull sharks, we have strict protocols in place to make sure all our divers have a safe and exciting experience. By showing our divers that we use a safety protocol, we are also telling them that we have to respect those sharks and that they are not harmless pets. Meeting the sharks from the safety of a cage! When we tell people about sharks, let's tell them the truth. Tell them that we have to be aware and take reasonable precautions when going into the ocean. Tell them that we shouldn't touch them, pull them by their tail or ride them and most importantly, let's lead by example. Stop promoting these irresponsible divers who touch, ride and hug the sharks, by not sharing their self aggrandizing pictures and videos. 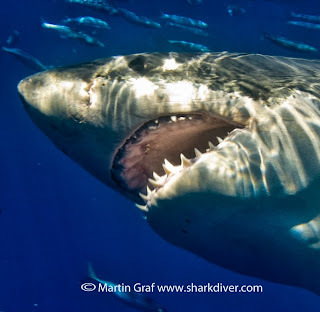 Great White Shark with some "love" bites. I've been diving with sharks for a long time and absolutely love them. But as I always tell our divers, "Make no mistake, I love these sharks, but it's NOT a mutual feeling". If you love sharks, love them for what they are, don't humanize them, don't make them into something they are not. If you try to make them out to be something they are not, you don't really love them. You want them to be something they are not. Let's go and meet those sharks!